Just weeks ahead of the 2019 Hyundai Santro (Hyundai AH2)’s world premiere in India, IAB’s automotive illustrator Shoeb Kalania has created a fresh rendering incorporating the latest details to preview its exterior design. The 2019 Hyundai Santro will employ a 69 PS 1.1L petrol engine and have an ARAI-certified fuel economy rating of 20.3 km/l. The render is in the 'Fiery Red' option. The 2019 Hyundai Santro will have an eye-catching cutesy face. The front-end will comprise swept-back lamps and an oddly-shaped large Cascading grille with chrome surround, flanked by mid-set fog lamps. On the sides, the “modern tallboy” will feature ORVMs with integrated turn signals and a peculiar kink in the beltline. At the rear, expect a cleanly-design tailgate with a wide opening, small lamps and the license plate indentation in the bumper. The Hyundai AH2 will ride on the previous generation Hyundai i10’s HA platform that has gone through many updates for safety compliance. 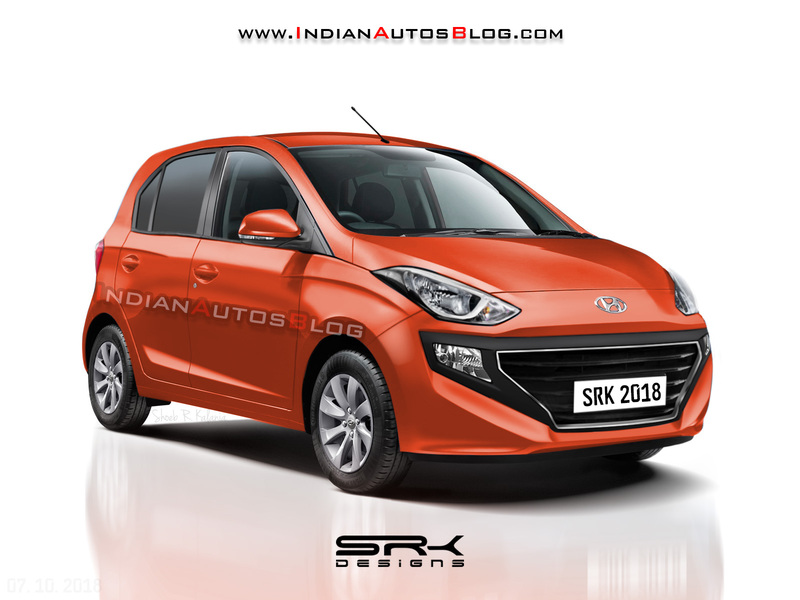 It will employ an updated version of the Hyundai Santro Xing’s 1.1-litre petrol engine. According to a recent report, the revised motor will deliver 69 PS and 99 Nm of torque. It will send power to the wheels via a 5-speed manual transmission or a 5-speed ‘Smart Auto’ automated manual transmission. It is said that the new entry-level hatchback will have an ARAI-certified fuel efficiency rating of 20.3 km/l, irrespective of the gearbox. The Hyundai AH2 will likely come with driver airbag, driver and co-driver SBR, speed alert warning system, manual override for central locking system and ABS as standard. Customers will have a choice of five equipment lines: Era, Magna, Sportz, Sportz (O) and Asta. The Asta grade should feature co-driver airbag, rear parking sensors, rear-view camera, rear AC vents, 7-inch touchscreen infotainment system with Apple CarPlay and Android Auto support, height adjustable driver seat and more. Hyundai will sell the 2019 Santro in five equipment lines: Era, Magna, Sportz, Sportz (O) and Asta. Following its media preview tomorrow, Hyundai will launch the all-new Santro in India on 23 October. Pre-bookings will start on the 10th of the month.